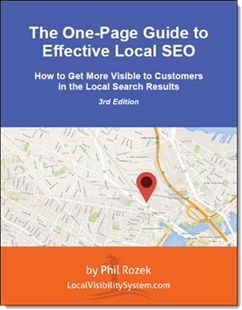 Why does Factual matter to your visibility in the local search results? Because it feeds info on your business to a bunch of other important sites. Apple Maps ace Andrew Shotland has also explained that Factual is a major source of business info (AKA data-supplier) for Apple Maps. 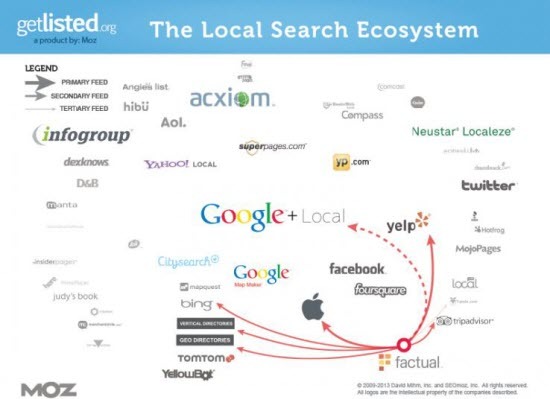 So that makes it official: Factual matters to your visibility in local search. The good news is that, as of this writing, it’s easy to get listed there. Here are a couple methods. Update 10/1/13: You can also skip ahead to the comment kindly left by Bradley Geilfuss, the Senior Product Manager at Factual. 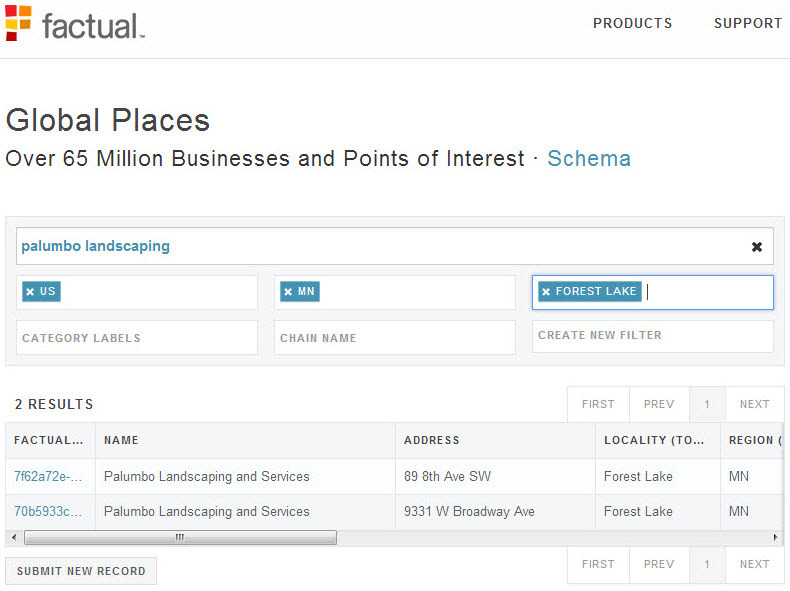 Factual doesn’t have an “add your business” feature. To get your listing added, you email them and they’ll create a listing for you. Before emailing them, I’d suggest first checking closely to see if you’re already listed by searching here: http://www.factual.com/data/t/places. 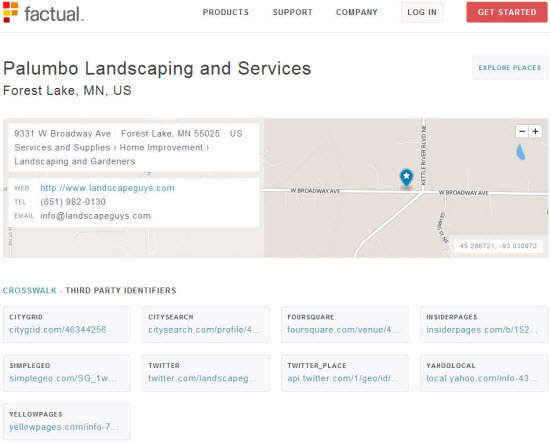 If you are listed, you can login and additional details to the listing – look for the little “edit” tag on the right side of the map. It’s cool how they show you the sources of the listing data under the “Crosswalk” section. If you’re not listed, look at all the other listings to see what fields they accept and make sure you include all the applicable fields when you email them. When you’re sure you’re not already listed, and you have gathered all the information needed for your listing, email them at datacontributions@factual.com to request adding your business to their database. Method 2. Fill out the form at http://www.factual.com/contact. Your request will end up at the same place. I’ve submitted requests for a few clients who weren’t already listed on Factual, and if anything noteworthy or unusual happens, I’ll update this post. Update 9/30/13: Based on what I’ve seen so far, it takes 5-7 days for Factual to approve and add a new listing, if you use either of the above methods. Any experience with Factual so far? Leave a comment. That may be a more convenient and scalable option to add multiple listings in one go. I just clicked on the “SUBMIT NEW RECORD”, which allowed me to add a company located in the Netherlands. After submitting it, I could immediately search it as it already existed. Great to know that it works well over in the Netherlands, too. Thanks, Eduard! The mailto links are primitive, but they’ll at least scaffold in the appropriate fields you should be sending. 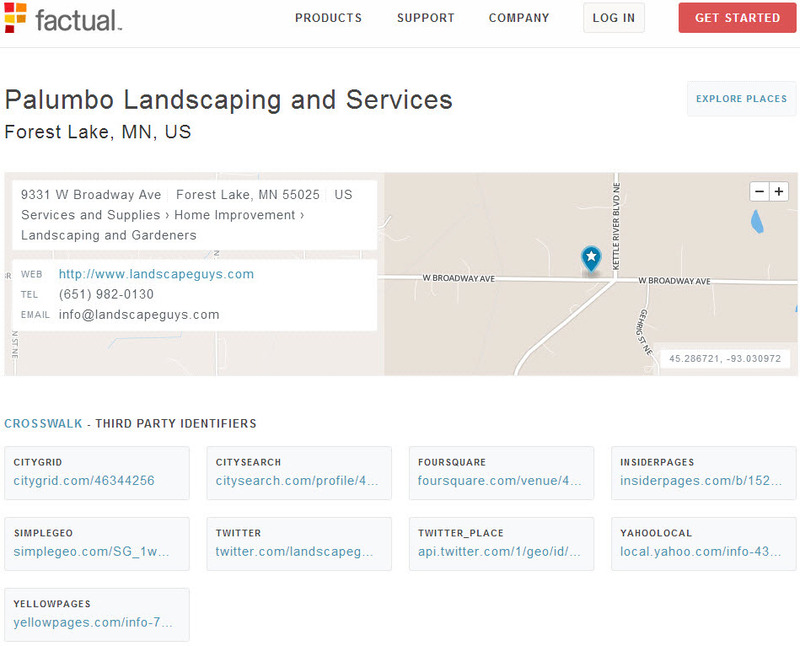 We’re building a fully interactive system that will help you find your existing business more easily, and fill in everything with much less work. That will be available very, very soon. Wow, that’s great to hear, Bradley. Thanks for the heads-up, and for stopping by! I look forward to seeing how the SMB-facing end evolves. I found my clients site listed. The listing included the NAP but there was no link to their website, or any category listed. I guess it is like an Unclaimed Listing. I followed the link that Bradley Geilfuss posted, and followed the instructions to send the update information. Hopefully it will get updated, and my clients ranking will improve. Thanks for posting this Phil. The email submission flat out is not working. I have attempted to add my business via email on 12/30/2013, 2/18/2014, as well as twice earlier in 2013 and have received neither a reply, nor has my business been added. I’m not sure if pleading is required or not, but I should hope that wouldn’t be necessary. To arbitrarily ignore a legitimate business’ request for admission is a little jarring. I’ve posted the information that I emailed and would be very interested to learn if I have done something wrong. Thank you. Hmmff. It looks like now they want you to email them – preferably with an email address on your domain. Great information. I was able to get listed on factual. Interesting post Phil – is David Mihm’s diagram still accurate ? Is there an official list of the directories / sites Factual is feeding data to published somewhere ?